Opel "Blitz" (Kfz.305) (4 x 2) During World War Two the German Army adopted and intensively used many types of cargo truck, but without doubt the three-tone Opel "Blitz" was the most famous of all Wehrmacht vehicles. With more than 100,000 built, these trucks with the Bitz's characteristic lightning emblem on the radiator front panel became symbolic of Germany's conquests. Its tire tracks could be seen in the great city squares of Europe; in the fields of France and also in the endless sands of the African desert; and it even overcame the infamous Russian mud. These trucks had a reputation of hardiness and being easy to repair which made them a legend. The story of the Opel "Blitz" began in the mid-1930s when the new German National Socialist government instigated a program of economic modernization with a clearly expressed militaristic direction. At this time the American General Motors concern had already owned the Opel factories for ten years and Opel had quickly become a major German car manufacturer, with a great family of different vehicle types. One of their most successful designs was the Opel "Blitz" S whose production started in 1936. When the 'Western dam' construction began, more than 10,000 trucks of different types were involved. 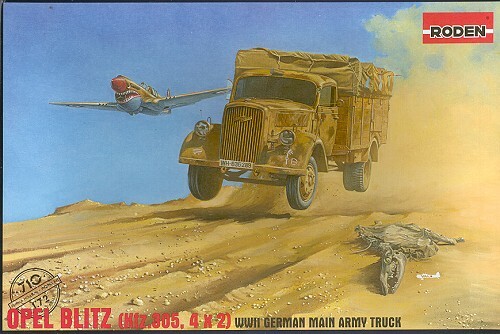 It was the original competition for military cargo trucks and the result was that the Opel "Blitz" won. The Opel factory received a massive order for this new standard Wehrmacht vehicle. The European conflict which started on September 1st, 1939, gathered pace with many fronts opening up, and obviously huge numbers of trucks were needed. Many thousands of civil Opel "Blitz" S produced before the war was drafted into army units. These civil trucks were brought up to army standard Kfz.305 - the official military designation for the Opel "Blitz". In all about 140 different army modifications were installed on the Opel "Blitz" chassis during the war years - they became radio cars, repair stations, fuel trucks, and even some exotic types like mobile laundries or printing-houses. Many other vehicles like staff buses or fire trucks were also based on the Blitz chassis. From 1937 up to 1944 nearly 140,000 vehicles were built, among them 82,356 standard army Blitz S trucks, 14,122 with a long wheelbase and also 8,363 with a low-level base. In 1942 another famous manufacturers, Daimler Benz AG was involved in Opel "Blitz" license manufacture. Mercedes-built trucks were visually identical to the standard Blitz but had their own designation, Mercedes L701. License production started only in 1944, when the main Opel factory in Russelheim was destroyed by Royal Air Force bombing. From the first days of war the Opel "Blitz" was very popular in the army. These trucks were integral to the organization of Panzer Divisions but unlike all other German trucks they used gasoline, and tanks used the same fuel. Ground pressure was low and the Blitz could overcome some obstacles which other types, even three-axle trucks, had problems with. Operation and repair in the field was very easy. The Eastern campaign demonstrated another advantage of the Opel "Blitz", whose gasoline engine could be easily and simply started with boiled water in very cold weather conditions, when diesel-fuelled trucks typically failed. Large numbers of trucks of this type were taken into the Red Army as trophies, and if the condition of the vehicles was satisfactory, they were used without any problem. Some Opel "Blitz"es even took part in Russian-Japanese battles in eastern China in 1945. This truck became a legend in the army and the absolute favorite among drivers. Some of them were convinced that Germany lost the war because the available quantity of Opel "Blitz"es was too little. Thanks to Roden for the background history. This very much appears to be a brand new mold of the ubiquitous Opel 'Blitz' 2.5-3 ton truck. Prior to this, the only other Blitz in this scale was by ESCI, and I believe that it has been reissued by Italeri. Regardless, this version comes on three sprues, two of which are identical and contain suspension parts. I don't doubt that Roden has cranked these out by the thousands. This provides for the inevitable onslaught of variations. As you read in the history section, over 140 different variants and modifications were done to this truck and you can be sure that Roden will cover several of the more interesting ones. Molded in a tan plastic, the quality of the molding is first-rate. No flash, no appreciable sink areas and only a few ejector pin marks, most of which will disappear when the vehicle is built. In fact, the only ones that may be visible would be on the underside of the bed and interior floorboard. The side and back panels are all superbly done with excellent detail. From what I can tell, this is a hard topped version with the steel cab. Later in the war, cabs were made from wood to save on strategic materials. You get a complete engine and a fully detailed chassis. Even the driver's floor pedals are included as well as a gear shift and brake handle. I'm not too thrilled about the two-piece rear axle housing, but it will eliminate any problems from shifted mold halves. There are wooden benches in the rear and one has the option of doing the rear top up or down. Acetate is provided for the transparencies. There are also a number of of rolls and shovels to attach to the outside of the vehicle. The engine side panels are separate, so you could leave them off to show the truck's engine. Instructions are quite well done with clearly drawn construction steps. Color information is provided using Humbrol and generic names. Markings for six vehicles are included in a variety of schemes, from overall Panzer Grey to desert and winter and blotched markings. Actually, that is a bit misleading as several of the schemes have no decals associated with them. Those of you who have built the older ESCI Blitz know what a nice model that made. It would take a lot to surpass it and Roden has done that with what will be a very popular vehicle.